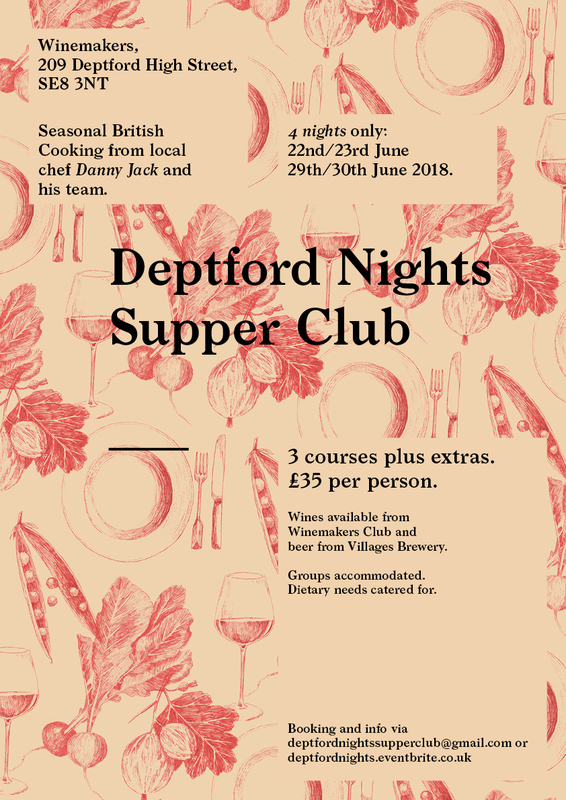 Deptford Nights is a series of 4 supper clubs by local chef Danny Jack and his team, taking place at Winemakers Deptford in Deptford High Street over two Friday and Saturday nights from 22nd to 30th June 2018. Tickets are just £37.50 (inc fees) for three courses plus extras, with wine to buy from Winemakers, and beer from the local Villages Brewery. Go! 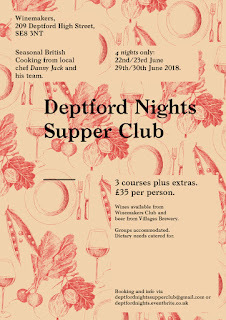 "Deptford Nights Supper Club at the Winemakers, Deptford is a one off Supper Club series from local chef Danny Jack and his team. What you can expect - We welcome you to the restaurant where we will kick the evening off with some exciting canapés and a special seasonal cocktail, a tasty non-alcoholic version will be available too. Once seated you will be treated to a sumptuous 3-course feast using carefully selected ingredients with an emphasis on seasonality and some foraged ingredients. The menu will be chosen the week of the event based on what is best in season at that time and inspiring to the chef and the team. We will start with some bread baked by Danny and some fresh vegetables with sharing dips. There will be a main course of either meat or fish with a vegetarian/ vegan option available upon request and an indulgent dessert to finish. We will have a bar offering wines by the glass or bottle that have been paired with the food and supplied by the WInemakers Club and beer available from local brewers, Villages Brewery."